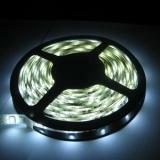 LED Flexible Strip Light 5050 is a high power illumination system. Bigger, more powerful SMD diodes provide nearly twice as much light as 3528 SMD. Application is similar – ceiling, bathroom and kitchen lights, furniture, shelves and cupboards enlightenment, etc. Widely used in advertising industry to make all kinds of light signs and channel letters. Due to low voltage, LED Flexible Strip Light is safe for all kind of environment including ships and vehicles.